China is punching back in the escalating trade dispute with the United States, announcing plans for heavy new tariffs on dozens more US goods including aircraft and autos. The Chinese Ministry of Commerce on Wednesday said it plans to impose a 25% tariff on $50 billion worth of US exports. The 106 affected products will also include soybeans and chemicals. China's announcement is a direct response to the Trump administration's publication Tuesday of a list of about 1,300 Chinese exports -- also worth about $50 billion annually -- that it intends to target with 25% tariffs. The quick-fire exchange of threats is intensifying fears of a full-blown trade war between the world's two largest economies. Markets dipped sharply as news of China's plans emerged. Experts said Beijing's latest announcement could be an effort to push the United States into negotiating a deal to defuse the trade spat. 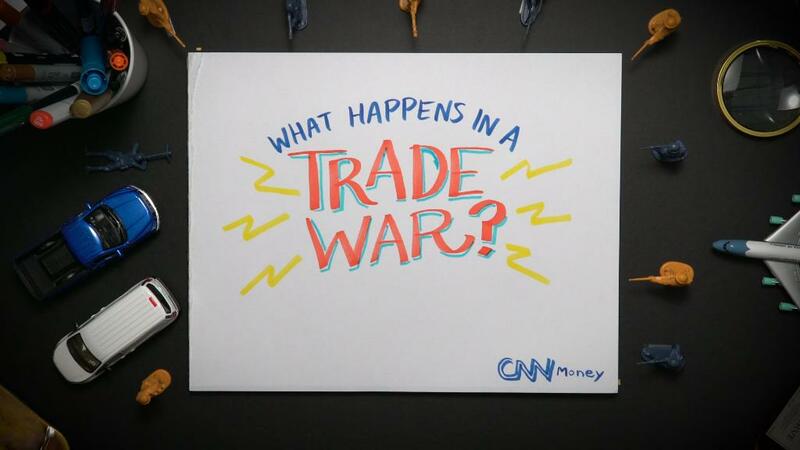 "The true purpose is not to escalate it to a trade war, but to demonstrate no weakness," said Aidan Yao, an economist at fund management firm Axa Investment Managers. It's still not clear when the new waves of tariffs announced by the two sides might take effect -- or if they'll be watered down in the meantime. China said the timing would be announced separately. The US government said it will hold a public hearing for US businesses about its plans next month. Chinese Vice Finance Minister Zhu Guangyao said at a news conference in Beijing that the period before the tariffs go into effect is the "time to negotiate and cooperate." Tommy Xie, an economist at Singapore-based bank OCBC, said it was unlikely that the latest tariffs from either side would come into force for another couple of months. But if talks during that period fail, then "the trade war starts," he warned. Many of the planned US tariffs would target the Chinese aerospace, tech and machinery industries. Others would target medical equipment, medicine and educational material, such as bookbinding equipment. China said the planned US move "seriously violates China's legitimate rights and interests under World Trade Organization rules and threatens China's economic interests and security." Beijing has already shown it is willing to fight back. On Monday, it put into effect tariffs on about $3 billion worth of US imports, including wine, pork, fruit and steel pipes. Those measures were a response to the Trump administration's earlier tariffs on imports of steel and aluminum from China and other countries. Beijing has called the metal tariffs an abuse of global trade rules. The Trump administration imposed the metal tariffs on the grounds of national security. For the new round of measures against China, it's citing a months-long investigation by the US Trade Representative into alleged Chinese theft of American intellectual property. It's a long-standing issue that US business executives and government officials have complained about, including practices like pressuring companies to hand over trade secrets in exchange for access to China's huge markets. But Chinese government officials dismissed the allegations on Wednesday. Vice Commerce Minister Wang Shouwen said claims China had forced companies to share closely guarded technology were "fake news," insisting all such deals were mutually agreed upon by businesses. The increasingly tense back-and-forth between Washington and Beijing over trade is freaking out markets. After China's latest move to hit back on Wednesday, Hong Kong's benchmark Hang Seng Index slumped, closing down more than 2%. US stock futures were also pointing to losses, with the Dow down more than 2%. Plane maker Boeing (BA) plunged more than 6% in premarket trading, and GM (GM) was down almost 4%. China is Boeing's second largest market after the United States. Commodity markets were also suffering. The price of soybeans, a major US agricultural export to China, fell about 4%. -- Serenitie Wang and Steven Jiang contributed to this report.